Cochrane’s global conference, taking place in Edinburgh in 2018, will be a ‘Patients Included’ event. Here, Cochrane’s Richard Morley and Sarah Chapman acknowledge the sensitivities around ‘patient’ and alternative terms, and look beyond it to the work in hand. This feels a rather good word with which to start a blog about our work to make Cochrane’s global conference in September 2018 a ‘Patients Included’ event (you can read more about that in our previous blog). Whilst it evokes a speediness which is far removed from the months of work needed to make this happen, we hope that after the event we will feel like we’ve pulled the rabbit out of the hat! However, this isn’t why we’ve started with ‘abracadabra’, the origins of which are contested, but which is said to be the most universally adopted word that is used without translation in many languages. Familiar to lots of us from magic shows, in past times it has been used with serious purpose to treat illnesses, and is often taken to mean “I will create as I speak”. 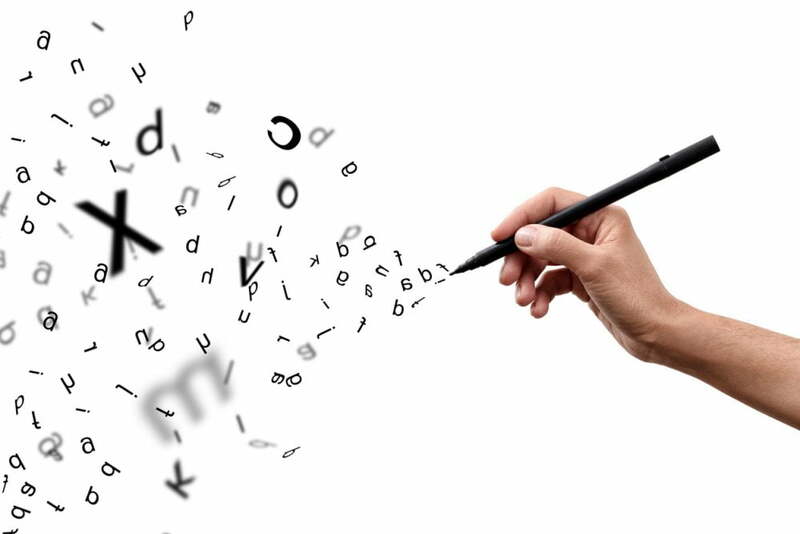 What power the words we use can have! No wonder the words used to describe patients, and other users of healthcare, cause strong feelings and divide opinion. Is this because of what we might create when we speak these names? We don’t want preparations for our conference, or the work we can do together there, and afterwards, to be derailed by linguistic divisions; nor do we wish to exclude, confuse or offend. We know we can’t achieve consensus, but we want to acknowledge the debate, explain what terms we will use, and to ask for support in, well, getting on with the job. We hope that actions will speak louder than words. Joe Fraser, whose recent article “It takes more than language to make a good patient-clinician relationship”, doesn’t buy it. “When I see a clinician in a hospital, I am a patient… To call me anything else would just sound wrong” (Fraser, 2017). He acknowledges that replacing ‘diabetic’ with ‘person with diabetes’ is meant to change the relationship, but feels it’s counterproductive, drawing attention to the sensitivities. It’s not the language of clinicians that causes hurt, he argues, but poor relationships, and the way to fix those is outside the remit of language. We think that those who have a strong preference for ‘person with’ phrasing would agree with this. The term ‘patient’ doesn’t suit many of our encounters with health information and services: when making choices about lifestyle, for example, or when accessing optional services; when we are pregnant, acting to avoid illness, optimizing health in our workplaces and so on. In these contexts, it can work perfectly well to specify the kind of people we are talking about – such as people in the workplace or pregnant women. Then there are those whose health-related experience is second hand, through their relationship with someone else. ‘Carer’ and ‘care-giver’ are terms that work for many but perhaps don’t cover the person who may be involved with caring for, or supporting, a relative, but isn’t their carer, as such. Talking about people with ‘lived experience of…’ seems to me to be useful here, and a term that has a wide spread, embracing the person living with a condition and a range of people who experience it from other perspectives. Yet this is also a phrase with its advocates and detractors. There are several alternatives in circulation. ‘Client’, ‘service user’, ‘consumer’ and ‘customer’ are in use but can be problematic, because of associations with the market, or their use in social work for example. Further than that, it has been argued that these erase “something that lies at the heart of medicine: compassion and a relationship of trust” (Tallis, 1999). From this perspective, the term ‘patient’ may smack of an unequal relationship that sits ill with us in 2017, but it also captures something positive about the relationship between healthcare providers and people who are in need of that care. If you have an association with Cochrane, you may well be aware that it uses the term ‘consumer’. Cochrane’s healthcare consumers are made up from a wide range of people, including patients (or people with personal experience of a healthcare condition), health and social care service users, care-givers and family members. Also included are people who represent or are advocates for patients and carers. What unites them all is their search for high quality, unbiased information about health conditions and treatments (Cochrane Consumer Network, 2017 ). This word ‘Consumer’ in Cochrane has long roots, reaching back to the early days of the organisation, and at least back to the formation of the Cochrane Consumer Network in 1995. The impetus for the formation of this network came from Australia, where the word is widely used and understood as it is in other parts of the world too. Whether this is the right word to use is often debated within Cochrane. But whilst many people don’t like the present word, there are no obvious alternatives. 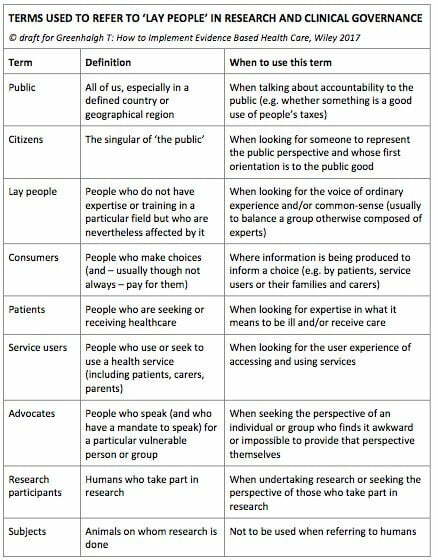 All other words (people, citizens, patients, service users etc.) come with values and associations and settling on an alternative, which is inclusive (for example in embracing first nation peoples in Canada, Australia, and New Zealand), and works across an international collaboration, is just about impossible. ‘Consumer’ is also a recognised brand within Cochrane and changing terms risks adding to uncertainty and confusion. Interestingly, participants in recent research about the best words to use to talk about patient data preferred the term ‘patient’ to terms like ‘citizen’, ‘consumer’ and ‘user’ (Wellcome Trust, 2017). There is no widespread agreement and with a range of views come very strong feelings. As an established term within Cochrane, we will be talking about consumers, and it would be odd to have a #PatientsIncluded event without talking about patients! With these terms floating to the top, we were interested to read what Trish Greenhalgh has to say about them in her new book ‘How to implement evidence-based healthcare’, which gives a glossary of terms for ‘lay people’ in which context guides usage (Greenhalgh, 2017). According to this scheme, it seems appropriate that we will be using the terms ‘patient’ and ‘consumer’. Patients here are defined as ‘people who are seeking and receiving healthcare’ and the term should be used ‘when looking for expertise in what it means to be ill and/or receive care’. Some people won’t like the definition of consumers: ‘people who make choices (and – usually, though not always – pay for them)’. But Greenhalgh’s suggested context for its use – ‘where information is being produced to inform a choice (e.g. by patients, service users or their families and carers’) gets straight to the heart of Cochrane’s overarching aim of producing trusted evidence to inform decisions for better health. From: Greenhalgh T. 2017. How to implement evidence-based healthcare. Oxford: John Wiley & Sons Ltd.
You say ‘patient’ and I say ‘consumer’. Let’s get on with the job! If we could find an easy solution, then we’re sure we would wave our magic wand and ‘Abracadabra!’ have it appear. Alas it’s far from simple and beyond our magical powers! Words are important, and in some cases we need the precision of defining quite specifically who we are seeking to involve or benefit. Whatever the solution, perhaps we can all agree that the important thing in the context of the forthcoming Colloquium is that the people for whom we all work in Cochrane and in health research generally, should be actively and meaningfully involved. In which case, can we acknowledge that there is a debate to be had, and then get on with the work? Join in the conversation on Twitter with @RMEngagement @SarahChapman30 and @CochraneUK, or leave a comment on the blog. An excellent piece – thank you!